» How do Social Media and Search Intersect? How do Social Media and Search Intersect? This session’s experts talked about how social media impacts SEO and organic rankings. They gave some great tips on how to use social media to improve your organic results. 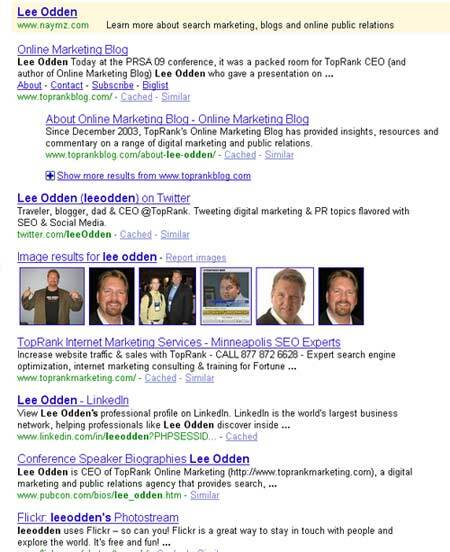 Lee Odden spoke about the importance of being involved in social media & how it interacts with search results. Transunion saved $2.5 million in 5 months by capitalizing on social media. Toprank.com averages 15-20 media & blog citations per month, which is equal to a $10k PR firm retainer. Umi Sushi restaurant in San Francisco gets 5 customers / day from social media (specifically from Yelp.com). 60% of marketers plan to take money away from traditional marketing & spending it on interactive marketing. It’s important to optimize social media for search – the role of SEO in social media is to directly influence the discovery of social communities or content via search. If social content is optimized, social profiles appear in search results. Bill started off by talking about the differences between old SEO tactics versus new strategies that incorporate social media. The new SEO strategy focuses on the old staples like creating site content, on-page optimization, along with new strategies like putting articles and more on your own websites as link bait. Social media will help get your website noticed and get attention for your content and link bait. Success in social media = getting noticed. Vote & comment often & genuinely on social bookmarking sites and Facebook. It’s key to have more links than others – you get noticed by people and crawlers. Word will spread through people linking back to you & retweeting. How to get market share of links? – keep an eye out for newsworthy content, and post content quickly. You can update/ edit later. Promote sites, articles, blog posts of those who link to you. A link to you is more powerful if the page also links to other links. Tony asks the question: is there an intersection between social media and search or is social media replacing search? The goal of social media is to be visible & stand out from the crowd. How? Create content that people will want to share. Content needs to be relevant, timely, and newsworthy. If people like your content enough they will share it. Where is the conversion opportunity? 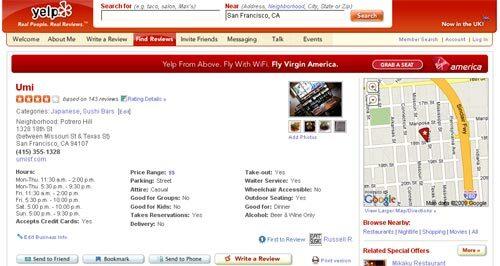 For local promotion – use sites like yelp. Social media is not a replacement for search – social media is not a conversion based business. Social traffic doesn’t typically convert, but it does get you engagement. 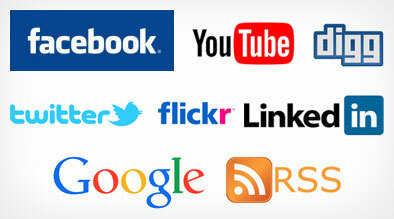 Social media creates online visibility. David also asks the questions: How do social media & search intersect and does social media prevent the need for search? The answer is no. Organic and paid search are most important for driving traffic. Social media does play an important role in search, and it also is very important for reputation management and in dominating the search engine results pages (SERPs) for the brand name. There are a vast number of people using social media – you can’t ignore these huge audiences & should tap into them. 99% of surveyed online retailers have facebook fan pages or plan to get them. 13% plan on it, 86% already have them. Is there really a valid excuse not to blog? You can cover news in your industry, or write commentary on news & hot topics. Gossip – often companies are afraid of what people might say. Well, they are already talking about you, so join the conversation. Oversight – we don’t want to manage social media. Get over it. It’s something that just needs to be done. How are companies using social media? Link building, customer service, promotions, contests, announcements, building networks, connecting on a more personal level. Use search to stand out, use social media to build brand loyalty. Any local business can benefit from social media. If you dominate the SERPs with social media profiles, if someone writes a negative blog post about you, their post is less likely to come up in the SERPs. Think of social media as long term linkbuilding. Use URL shorteners to track links, so you can record the number of click-throughs. One key point really stood out at the end of this session. Yes, it is important to monitor your brand’s reputation online and become active in the online community, but Social Media can also have a very important role to play when it comes to SEO. From dominating the SERPs to adding backlinks and relevancy, companies who don’t leverage Social Media will be missing out on a huge opportunity and will be leaving themselves vulnerable to their competitors who do.